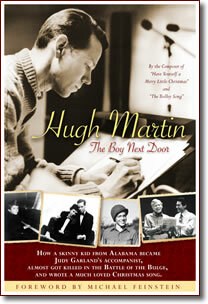 Hugh Martin’s autobiography will be available on November 1st at Barnes & Noble bookstores (and their website, of course). The book is available for pre-order from the publisher’s site: www.atlasbooks.com. Martin is perhaps best known for writing the songs (with Ralph Blane) for Judy’s 1944 masterpiece Meet Me In St. Louis. Of course, he had a long and varied career, much of it tied to Judy’s. He’s also one of the few folks still around who was a part of the legendary “Freed Unit” at MGM during its heyday. Should make for some interesting reading.